If you want to brighten up your navel piercing you can’t go wrong with our new neon belly bars! These super-bright belly button bars feature neon balls that really stand out against your skin. 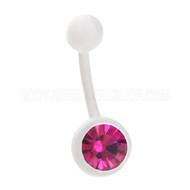 Each neon belly bar has a 316L surgical steel stem and acrylic balls. The acrylic balls are very lightweight, smooth and durable, so they are comfortable to wear. Plus these cute belly bars are just Â£2.95 each, so thereâ€™s not excuse to shy away from colour this summer! This style of belly bar is also available in yellow and green, so the more adventurous amongst you. You can also buy the neon belly bar balls separately, which means that you can customise your existing belly button jewellery or match your other piercings to your belly bar. Mix and match the colours, add these cute threaded balls to all your piercing jewellery or coordinate your colours for a truly eye-catching look. This entry was posted in Acrylic Body Jewellery, Belly (Navel) Piercings, Navel Bananabells and tagged Acrylic Belly Rings, Belly (Navel) Piercings, Belly Bar, Belly Button Navel Ring, Belly Button Navel Rings, Belly Button Ring, Belly Button Rings, Belly Piercing, Belly Ring, Belly Stud, Cute Belly Bars, Cute Belly Rings on May 11, 2010 by Piercing Guru. Your belly button navel ring says a lot about you; with such an infinite range of belly button navel jewellery available,Â make your personality shine! Belly button navel rings are available in a magnificent range of styles, colours and designs to suit your every need. Belly button navel rings can be flashy or simple; glamorous or practical… or even both! The jazzyÂ spectrum of colours available in ourÂ Titanium belly button navel ring rangeÂ will brighten up any belly button piercing. Titanium belly button rings are available in several different styles, including ball closure rings, circular barbells and smooth segment rings. This glamorous range of belly button navel rings features a surgical steel ring with a silver charm clipped into the gap. A very cute and feminine range, this belly button navel ring is sure to put a smile on her face! If you’re after something very lightweight, comfortable and easily fitted, these acrylic navel belly button rings are the ideal choice. 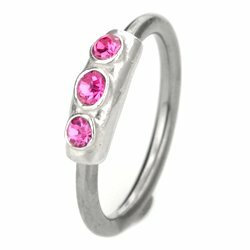 Acrylic is very soft and flexible, making your belly button ring exceptionally easy and quick to remove and replace, any time and anywhere. Acrylic belly button navel rings are also great for surgical operations and any time you require a non-metal belly button piercing retainer. This entry was posted in Acrylic Body Jewellery, Ball Closure Rings, Belly (Navel) Piercings, Blackline Body Jewellery, Circular Barbells, Surgical Steel Body Jewellery, Titanium Body Jewellery and tagged Belly Button Navel Ring, Belly Button Navel Rings, Belly Button Ring, Belly Button Rings, Belly Ring, Navel Ring on November 25, 2009 by Piercing Guru.